C. J. Vorosmarty, Ericson, J. P., Dingman, S. L., and Ward, L. G., “Future impacts of fresh water resource management: sensitivity of coastal deltas”, International Association of Hydrological Sciences (IAHS), vol. 314. Copenhagen, Copenhagen, Denmark, pp. 231-238, 2007. C. E. Parrish, “Vertical Object Identification in Full-Waveform Topographic Lidar Data”, Joint Airborne LIDAR Bathymetry Technical Center of Expertise Coastal Mapping and Charting Workshop (JALBTCX). Seattle, WA, USA, 2007. A. P. Lyons, Weber, T. C., and Gustafson, M. J., “An experimental study on the causes of non-Rayleigh scattered envelope statistics”, Underwater Acoustic Measurements: Technologies & Results (UAM). Heraklion, Crete, Greece, pp. 0-0, 2007. L. V. Morgan and Pe'eri, S., “Quality Assurance of Airborne Lidar Bathymetry Products for Shoreline Mapping”, American Geophysical Union (AGU). San Francisco, CA, USA, 2007. A. P. Lyons, Parks, S., and Weber, T. C., “An Experimental Test for Scattered Envelope Statistics”, Acoustical Society of America (ASA). New Orleans, LA, USA, pp. 0-0, 2007. A. P. Lyons and Weber, T. C., “A multibeam sonar survey for benthic lake habitat: Assessing the impact of invasive mussels in Seneka Lake, New York”, Underwater Acoustic Measurements: Technologies & Results (UAM). Heraklion, Crete, Greece, pp. 0-0, 2007. L. G. Ward, “Depositional systems on the New Hampshire continental shelf: formation and controlling processes”, Geological Society of America. 2007. C. E. Parrish and Scarpace, F. L., “Detection of Vertical Objects in Full-Waveform Lidar Data Using a 3D Wavelet-Based Approach”, American Society for Photogrammetry and Remote Sensing (ASPRS). Tampa, FL, USA, 2007. C. E. Parrish, “Exploiting Full-Waveform Lidar Data and Multiresolution Wavelet Analysis for Vertical Object Detection and Recognition”, IEEE International Geoscience and Remote Sensing Symposium (IGARSS). Barcelona, Barcelona, Spain, 2007. J. Miksis-Olds, Donaghay, P. L., Miller, J. H., Tyack, P. L., and Nystuen, J. A., “Noise Level Correlates with Manatee Use of Foraging Habitats”, Journal of the Acoustical Society of America, vol. 121. Acoustical Society of America, San Francisco, CA, pp. 3011-3020, 2007. P. Mitchell, “The Perceptual Optimization of 2D Flow Visualizations Using Human-in-the-loop Local Hill Climbing”, University of New Hampshire, Durham, NH, 2007. L. Soares Rosa, “Seafloor Characterization of the Historic Area Remediation Site Using Angular Range Analysis”, University of New Hampshire, Durham, NH, 2007. D. S. Brogan and de Moustier, C., “Upgraded Seafloor Detection Algorithm for Swath Bathymetry Applications of the Volume Search Sonar”, University of New Hampshire (UNH), Center for Coastal and Ocean Mapping (CCOM)/Joint Hydrographic Center (JHC), 2006. L. Fonseca, “Acoustic Backscatter and Remote Seafloor Characterization”, International Marine Technicians Symposium (INMARTECH). Woods Hole, MA, USA, 2006. C. de Moustier, “Fred Fisher's high pressure work with eyewash and epsom salts”, Journal of the Acoustical Society of America, vol. 120. Acoustical Society of America, Melville, NY, USA, pp. 3299-3299, 2006. C. W. Holland, Weber, T. C., and Etiope, G., “Acoustic Scattering from Mud Volcanoes and Carbonate Mounts”, Journal of the Acoustical Society of America, vol. 120. Acoustical Society of America, Melville, NY, USA, pp. 3553-3565, 2006. C. de Moustier and Brogan, D. S., “Comparison of Extended Kalman Filtering with Split-aperture Processing for Angle of Arrival Estimation in Multibeam Echo-sounding”, Journal of the Acoustical Society of America, vol. 119, pp. 0-3, 2006. J. Curcio, McGillivary, P. A., Fall, K., Maffei, A., Schwehr, K., Twiggs, B., Kitts, C., and Ballou, P., “Self-Positioning Smart Buoys, The 'Un-Buoy' Solution: Logistic Considerations Using Autonomous Surface Craft Technology and Improved Communications Infrastructure”, IEEE Oceans. Boston, MA, USA, pp. 0-5, 2006. D. S. Brogan and de Moustier, C., “Preliminary Report on Issues Affecting the Usability of Data Collected During October 2006 WASSP Tests in New Hampshire”, University of New Hampshire (UNH), Center for Coastal and Ocean Mapping (CCOM)/Joint Hydrographic Center (JHC), 2006. C. de Moustier, “WASSP sea tests M/V Acheron”, US Army Corps of Engineers(USACE), 2006. F. S. Henyey, Tang, D., Williams, K., Lien, R., Becker, K., Culver, R. L., Gabel, P., Lyons, J., and Weber, T. C., “Effect of nonlinear internal waves on midfrequency acoustic propagation on the continental shelf”, Acoustical Society of America (ASA). Providence, RI, USA, pp. 0-0, 2006. G. McGillicuddy and Huff, L. C., “FishPAC Field Report for the Free-fall Cone Penetrometer”, University of New Hampshire (UNH), Center for Coastal and Ocean Mapping (CCOM)/Joint Hydrographic Center (JHC), 2006. D. H. House, Blair, A. D., and Ware, C., “An Approach to the Perceptual Optimization of Complex Visualizations”, IEEE Transactions on Visualization and Computer Graphics, vol. 12. IEEE, Washington DC, Washington DC, USA, pp. 509-521, 2006. R. Conrad, “Development and Characterization of a Side Scan Sonar Towfish Stabilization Device”, 2006. J. P. Ericson, Vorosmarty, C. J., Dingman, S. L., Ward, L. G., and Meybeck, M., “Effective sea-level rise in deltas: Causes of change and human dimension implications”, Global and Planetary Change, vol. 50. Elsevier, New York, NY, USA, pp. 63-82, 2006. S. Pe'eri and Philpot, W. D., “Increasing the Existence of Very Shallow-water LIDAR Measurements Using the Red-channel Waveforms”, IEEE Transactions on Geoscience and Remote Sensing, vol. 75. IEEE, Washington DC, Washington DC, USA, pp. 1217-1223, 2006. 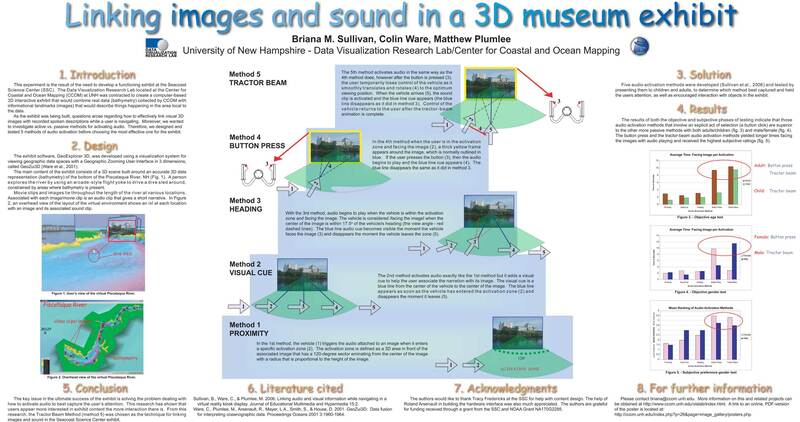 B. M. Sullivan, Ware, C., and Plumlee, M. D., “Linking Audio And Visual Information While Navigating In A Virtual Reality Kiosk Display”, Journal of Educational Multimedia and Hypermedia, vol. 15. Association for the Advancement of Computing in Education, Chesapeake, VA, USA, pp. 217-241, 2006. 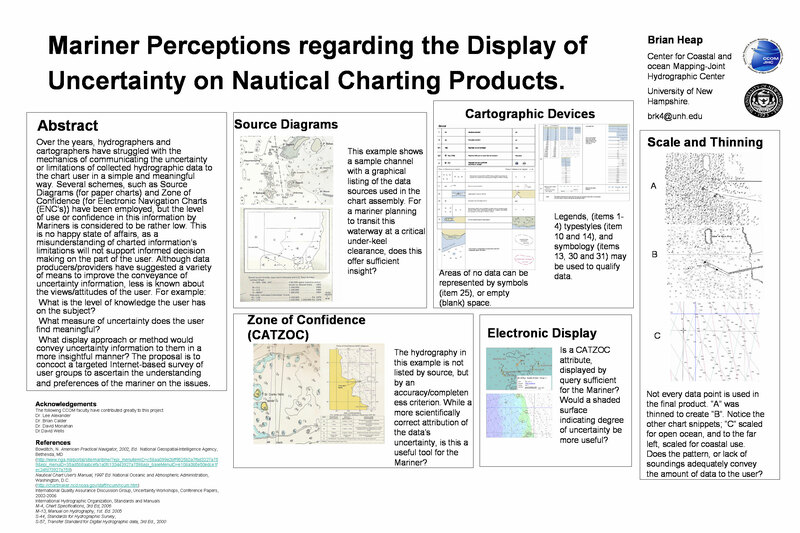 B. Heap, “Mariner Perceptions regarding the Display of Uncertainty on Nautical Charting Products”. 2006. M. D. Plumlee and Ware, C., “Zooming vs. Multiple Window Interfaces: Cognitive Costs of Visual Comparisons”, ACM Transactions on Computer-Human Interaction, vol. 13. Association for Computing Machinery (ACM), New York, NY, USA, pp. 1-31, 2006. D. H. House, Bair, A., and Ware, C., “On the Optimization of Visualizations of Complex Phenomena”, IEEE Visualization (VIS). Minneapolis, MN, USA, pp. 87-94, 2005. C. de Moustier, “R/V Kilo Moana EM1002 Status Report”, University of New Hampshire (UNH), Center for Coastal and Ocean Mapping (CCOM)/Joint Hydrographic Center (JHC), 2005. S. C. Martin, Whitcomb, L. L., Arsenault, R., Plumlee, M. D., and Ware, C., “A system for real-time spatio-temporal 3-D Data Visualization in Underwater Robotic Exploration”, International Conference on Robotics and Automation (ICRA). Barcelona, Barcelona, Spain, pp. 0-0, 2005. D. S. Brogan and de Moustier, C., “3-D Spatial Sampling with a Cylindrical Multibeam Sonar Array, Final Report on Bathymetry and Co-registered Backscatter Extraction from the Volume Search Sonar of the AQS-20 Mine Countermeasure System”, University of New Hampshire (UNH), Center for Coastal and Ocean Mapping (CCOM)/Joint Hydrographic Center (JHC), 2005. C. E. Parrish, Tuel, G. H., Carter, W. E., and Shrestha, R., “Configuring an Airborne Laser Scanner for Detecting Airport Obstructions”, Photogrammetric Engineering and Remote Sensing, vol. 71. ASPRS: The Imaging and Geospatial Information Society, Bethesda, MD, USA, pp. 37-46, 2005. D. H. House, Bair, A., and Ware, C., “The Optimization of Visualization of Complex Phenomena”, IEEE Visualization (VIS). Minneapolis, MN, USA, pp. 87-94, 2005. L. G. Ward and Bub, F. L., “Temporal variability in salinity, temperature and suspended sediments in a Gulf of Maine Estuary (Great Bay Estuary, New Hampshire)”, in High Resolution Morphodynamics and Sedimentary Evolution of Estuaries, vol. 8, no. D.M FitzGerald, J. Knight, New York, NY, USA: Springer Publisher, 2005, pp. 115-142. E. M. Neufeld, Kristtorn, S. K., Guan, Q., Sanscartier, M., and Ware, C., “Univ. of New Hampshire Exploring Causal Influences”, Electronic Imaging: Science and Technology (EI), vol. 5669. San Jose, CA, USA, pp. 52-62, 2005. G. R. Elston, “Shoals Lidar Waveform Characterization and Bottom Classification: Final Report”, University of New Hampshire (UNH), Center for Coastal and Ocean Mapping (CCOM)/Joint Hydrographic Center (JHC), 2005. S. Fuhrmann, Ahonen-Rainio, P., Edsall, R., Fabrikant, O. S., Koua, E. L., Tolon, C., Ware, C., and Wilson, S., “Making Useful and Useable Geovisualization: Design and Evaluation Issues”, in Exploring Geovisualization, no. J. Dykes, A.M. MacEachren & M.J. Kraak, New York, NY, USA: Elsevier, 2005, pp. 541-554. 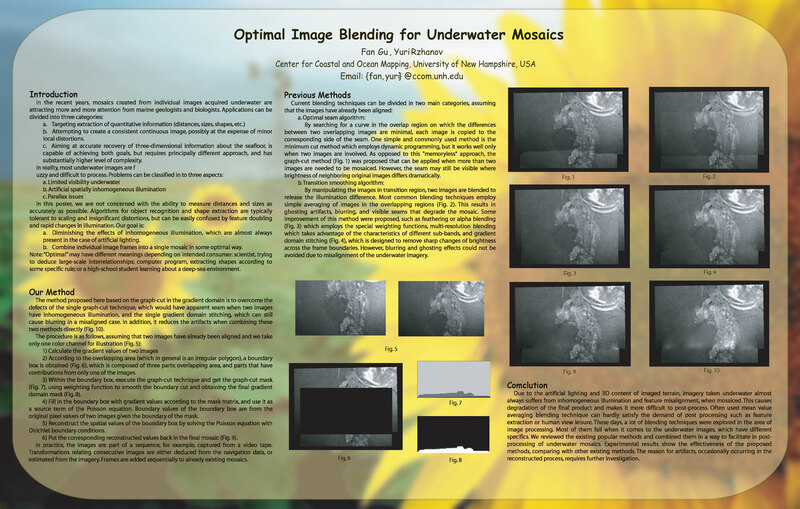 A. Bair, House, D. H., and Ware, C., “Perceptually optimizing textures for layered surfaces”, ACM SIGGRAPH Symposium on Applied Perception in Graphics and Visualization (APGV). Coruna, Coruna, Spain, pp. 67-74, 2005. C. W. Holland, Weber, T. C., and Etiope, G., “Close-range acoustic scattering from mud volcanoes”, Acoustical Society of America (ASA). St. Andrews, New Brunswick, Canada, pp. 0-0, 2005. 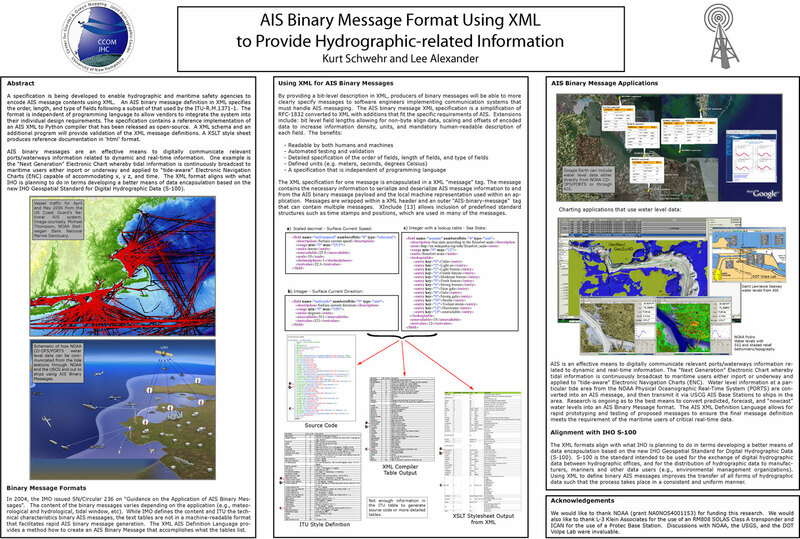 M. D. Plumlee, Ware, C., Arsenault, R., and Brennan, R. T., “Panoramic Images for Situational Awareness in a 3D Chart-of-the-Future Display”, U.S. Hydrographic Conference (US HYDRO). San Diego, CA, USA, pp. 0-8, 2005. D. S. Brogan and de Moustier, C., “3-D Spatial Sampling with a Cylindrical Multibeam Sonar ,”, Acoustical Society of America (ASA). St. Andrews, New Brunswick, Canada, pp. 0-0, 2005.